The Powderhouse Trail earned it’s name from the fact that near the top of the trail you will find what is left of an old powderhouse. Dan’s Trail leads from Chip Ross Park to the top of Bald Hill from which you can overlook the university town of Corvallis. At the top you’ll find a bench upon which to rest and a hitching post to tie horses. Want an education in forestry? Take a walk along the experimental management trail. 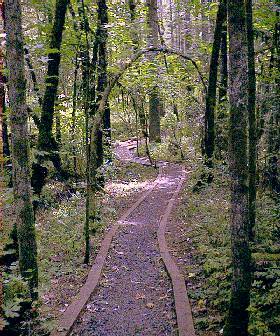 This trail has 13 stops dedicated to educating people about all aspects of forestry and forest managment.